This desert adventure will see you traveling to the African planes to observe the varied lives of the many exotic animals that call these parched lands home. Click here to play! Discover their living patters for a chance to bring in Mega Moolah. One of the most illusive beasts in these golden lands is the lion. Keep a close eye out for this giant feline as it acts as a wild symbol. It will not only replace most other symbols to help you spin in more wins, but it will also double prizes when it appears in a winning combination. He'll also bring in up to 15000 times your line bet. There are plenty of other animals to watch out for. The elephant will bring in 750 times your line bet if you spot two to five of them on the reels. Two to five buffalos will get you up to 600 times your line bet. Also bringing in big prizes are giraffes, zebras, and gazelles. While you're searching the hot, dry land of Africa, you'll definitely want to watch out for the wise baboons. This clever monkey seems to watch over the rest of the animals. Plus, it acts as a scatter and will get you a number of free spins if you can spy three or more anywhere on the board. Travel these enchanting lands for a glimpse at exotic creatures and plenty of big money wins! The baboon acts as a scatter. Spin this monkey two to three times anywhere on the board and you'll multiply your total bet by 2, 3, 20, 100 respectively. If you spin three or more anywhere on the board, you will trigger 15 free spins in which prizes are tripled. The lion acts as a wild symbol. Spin two to five of this massive beast across an active pay line and get up to 15000 times your line bet. He will also substitute for all other symbols to help you create more wins as well as double any prize when he appears in a winning combination. A bonus feature is triggered randomly. It is a fortune wheel type of bonus in which you spin a wheel for a chance at the progress jackpot. 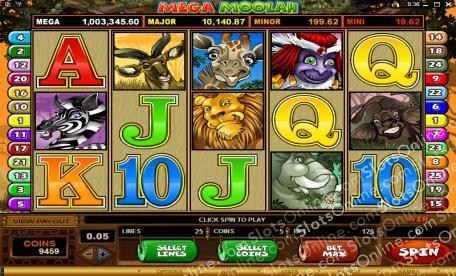 There are four different levels of the jackpot: mini, minor, major, and mega. Whatever color your spin stops on dictates what level of the progressive jackpot you win.